Archaeologists finish seven years of restoration work on a 2,000-year-old drainage tunnel in the Old City. It is not adjacent to the Temple Mount. Archaeologists have finished seven years of work for the restoration of a 2,000-year-old drainage tunnel not far from the Temple Mount in Jerusalem’s Old City. 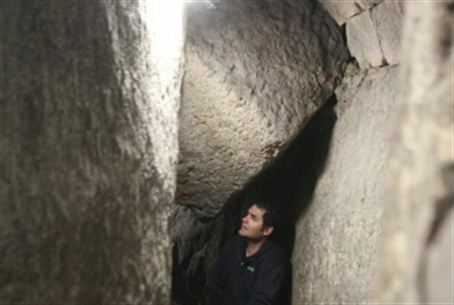 The Israel Antiquities Authority pointed out that the 600-meter-long tunnel, built during the era of the Second Temple and used for draining rainwater, does not go under the Temple Mount and is not adjacent to it. Part of the tunnel has been open to the public, and the entire length will be opened soon, IAA officials said. The tunnel leads from the Davidson Archeological Park and Center, south of the Temple Mount, and ends towards the City of David (Ir David), located across the street from the Western Wall. The City of David is a Jewish neighborhood in the Silwan Valley. The Palestinian Authority and the Peace Now group have objected to the restoration, claiming, as they have done about other IAA excavations, that the archeological work violates international law and may be a subterfuge for alleged attempts to dig under the Al Aqsa mosque on the Temple Mount. "The problem is that no one is sure that they are not going to dig under the Haram al-Sharif [mosque], and when you dig in that context, you risk causing an explosion,” Peace Now's Hagit Ofran told the French news agency AFP. Jerusalem’s chief Muslim cleric criticized the United Nations for failing to stop the restoration work. The IAA maintained that the work was purely archeological and that there was "no intention of igniting inter-religious tensions." The tunnel can only be accessed from the Silwan Valley side, but there are plans to open up the other entrance near the Davidson Center; both entrances are not adjacent to the Temple Mount and the line between them is under a road on the side of the Old City walls. Lawyers for Arab residents in the Silwan Valley argued in the High Court in 2009 that Israel intended the drainage tunnel to be a link between Silwan and the Western Wall, which is unconnected to Al-Aksa and not a problem, unless one is against all Jewish presence in the Old City.